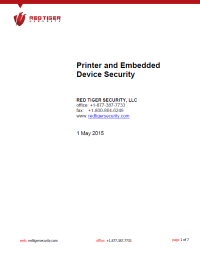 Download this white paper to learn the known security issues with printers and embedded devices, as well as to gain tips, techniques and recommendations for implementing a security strategy for this class of devices. Today, most organizations do not have a security strategy in place for printers and embedded devices, leading to cybersecurity threats impacting Corporate Information Technology (IT) Networks. Since printers and embedded devices are typically left deployed with all of the default usernames, passwords, TCP, and UDP ports left open, they are a security threat that companies must take seriously.